Siqnal is a program within the area of software that goes under the name Product Data Management Software (PDM) and is developed using the latest PDM technologies. Siqnal is the perfect choice for Product Data Management Software, if your company aspires to work efficiently with your data and needs to have a high data quality. 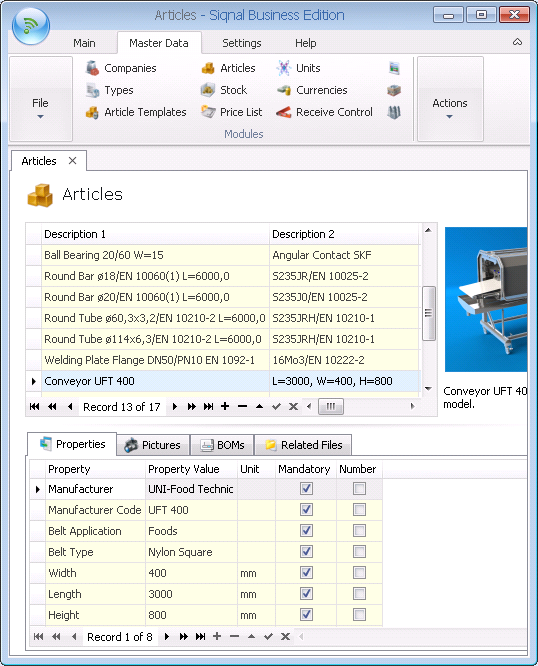 PDM Tool 1: Article properties defined by the user and grouped by article types. 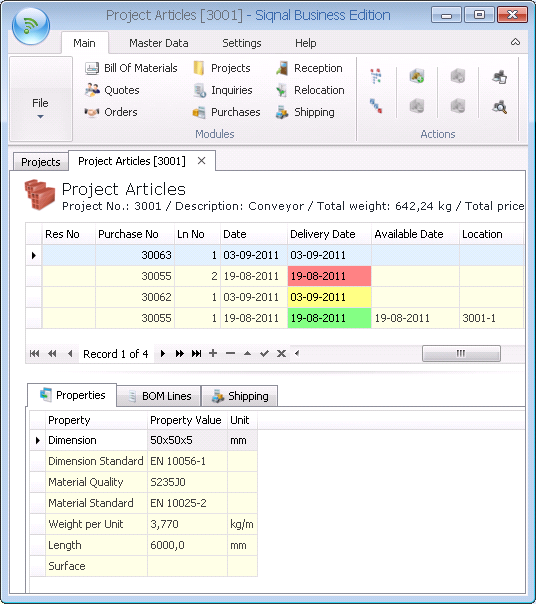 One of the uniquenesss of the Siqnal Product Data Management Software is the way articles are defined by properties. Properties are defined by the user of the program or can be downloaded from this web site under the Download Types menu. Properties are used as the basis of all article descriptions, which are generated automatically when articles are defined, which is for example when creating an article template, bill of material line, purchase- and sales lines, etc. Properties are divided into static and dynamic properties, where dynamic properties are the ones that are defined upon consumption of the article. PDM Tool 2: Automatic weight calculations. Weight calculation is automatically calculated for all types that have the property alias line Weight per Unit. Weight calculations are calculated in the modules BOM Lines, Stock, Project BOM Lines and Project Articles. Calculations are defined in kilograms (kg). PDM Tools: Automatic weight calculation. PDM Tool 3: Monitoring the delivery terms. When working with projects, is it extremely important to have a quick overview of status on ordered articles, to quickly spot problems with exceeded delivery dates. Siqnal can monitor all articles on projects and show an alarm in the form of red-flagged fields in the module Project Articles. PDM Tools: Delivery date alarm. PDM Tool 4: Calculated cost price on bills of materials. 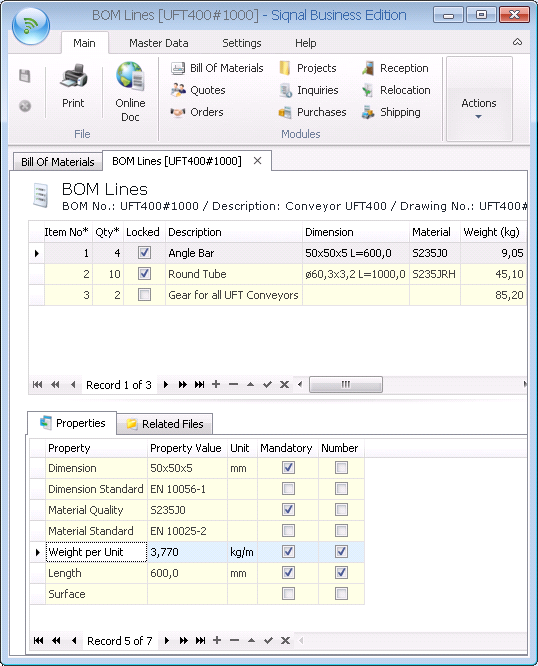 When a bill of materials is created in the BOM lines module, the total cost price is automatically calculated based on the latest cost prices of the consumed article, meaning that it can quickly be identified if any modification is to be made in relation to the expected cost price of the BOM. When BOMs are later used as part of orders and quotes, the cost price can automatically be re-calculated to ensure the cost price is still valid. 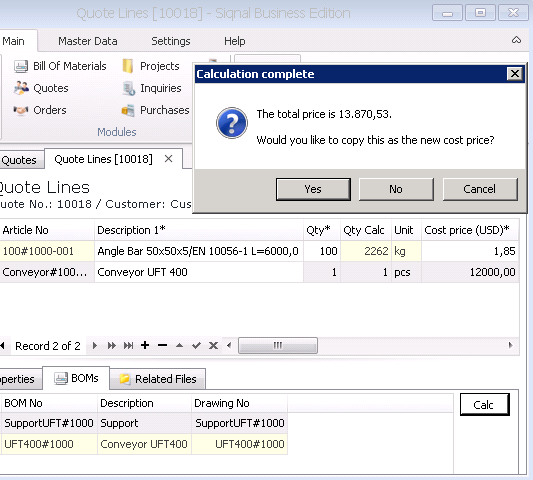 PDM Tools: Calculate cost price. PDM Tool 5: Criteria locks to ensure created data are valid and of high quality. Siqnal ensures that it is not possible to edit data that are not meant to be edited by using criteria locks. This means that you can for example not edit a Bill of Materials that is already consumed on at least one project, while at the same time allowing it to be used as-is on other projects. In the event that a slightly modified version must be used on another project, the BOM can be copied. PDM Tools: Criteria locks (Read only). PDM Tool 6: Data defined once but consumed an infinite number of times. Siqnal ensures that data are defined only once and can be consumed an infinite number of times throughout the Siqnal Product Data Management modules from Quotations to Shippings. The benefit is that is no longer needed to key in redundant data, freeing resources for creative work  or even optimizing the data flow to such a degree that personnel can be cut. PDM Tool 7: Currency control on sales- and cost prices. Siqnal handles currencies and exchange rates automatically, meaning that it is possible to buy and sell articles in different currencies. Cost- and sales prices are automatically converted into the Companys native currency.